Many people are not aware of this fact, but copiers can have effect on the health of the people working in your office. While it’s usually not life threatening, most copiers on the market produce Volatile Organic Compounds. These are compounds that may not be good for humans to breathe. At Colorado Springs Copier we want to make sure that making your office safe for a copier is a simple process. The most common Volatile Organic Compound produced by copiers is Ozone. Ozone is great for the planet, but is not easy for humans to breathe. Ozone can have a variety of negative health effects. Ozone affects the lungs and can be an irritant for people with a history of asthma or lung problems. Ozone can cause inflammation of the lungs and make it uncomfortable to for some people to breathe. 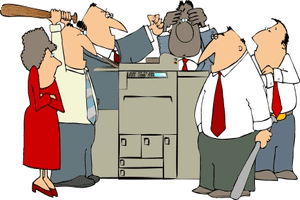 Copiers are not dangerous machines, and most people will never notice if ozone is being produced. Still, we want to encourage making your workplace a safe space for everyone using a copier. It is easy to make sure you’re doing everything on your part to keep the office healthy. Find out if your copier produced Volatile Organic Compounds. Look in your user’s manual or call your copier leasing company for more information. Move your copier away for being directly next to anyone in the office. You don’t want someone sitting and breathing in ozone all day long. Make sure your copier is in a well-ventilated area. Regularly change your filters. Look for black spots on the wall adjacent to your copier. This can be a sign that you need to change your filters. Copiers are extremely user friendly machines, but protecting your office environment is important. It doesn’t take much to make your office safe for a copier.